Bri Ribaj: Bananas Non Plus? The following is from Tyler over at marginal revolution. 'You will never, ever find a seed in a supermarket banana. That is because the fruit is grown, basically, by cloning...Every banana we eat is a genetic twin of every other. I know I would miss my daily banana. Breakfast would lose some of its relevance without it. '...but the biggest mystery about the banana today is whether it will survive. A seedless fruit with a unique reproductive system, every banana is a genetic duplicate of the next, and therefore susceptible to the same blights. Today’s yellow banana, the Cavendish, is increasingly threatened by such a blight—and there’s no cure in sight. Read more of the book review here. 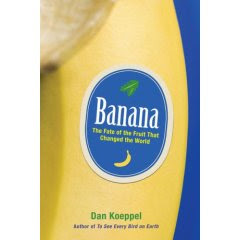 like Koeppel says this is not just about bananas but rather about technological and economic choices. bananas are but a minor, representational form. A good example of concatenation. Yet another example where a banana represents a much larger text than its very self.